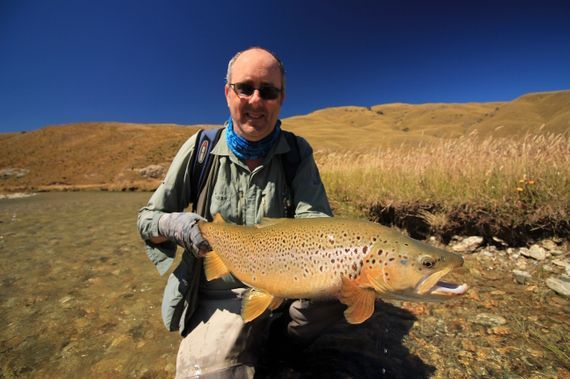 Join internationally recognized fly fishing guide and writer, Chris Dore for an experience on some of the world’s finest trout streams, where he will introduce you to the superbly conditioned brown and rainbow trout which abound in Southland's unparalleled waters. The rivers you have dreamt about are Chris's home waters, and his much sought after local knowledge and many years of exploration will ensure that your visit is a memorable one. 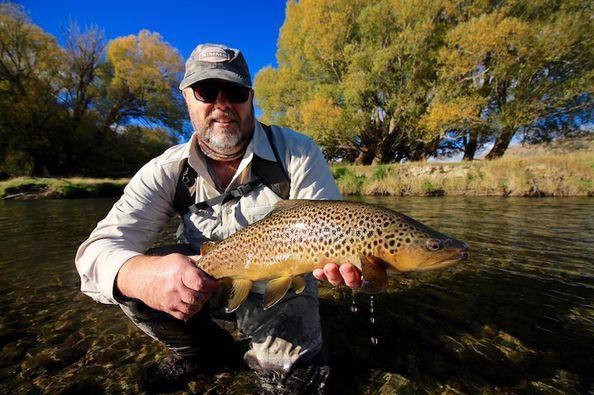 As an FFF Certified Casting Instructor and member of the New Zealand Professional Fishing Guides Association, Chris is the obvious choice for an unforgettable foray into the worlds premier fly fishing destination. When not on the river, Chris is the Marketing and Promotions Ambassador for Manic Tackle Project, New Zealand and Australias largest fly fishing tackle distributer where he hosts public events, talks, fly casting and product demos from our brands including Simms, Scott Fly Rods, Waterworks Lamson, C&F design, Airflow, Hatch, Primal, MFC and Loon Outdoors. As you can see, Chris is a people person, so you won't have any problem sharing a few days or more on the river together. 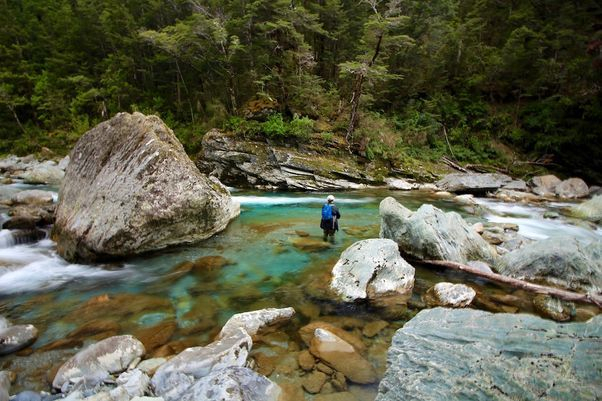 Southland is home to more rivers and streams than any other province in New Zealand. Blessed with an abundance of productive spring creeks, freestone rivers, rain fed streams and lakes of many sizes, and of course the pure wilderness of Fiordland, the Southland angler never has to travel far to experience a diverse range of waters, and these are the basis for some of the worlds finest trout fishing. It is the trout these waters hold, both rainbow, and predominantly brown, which gives the Southland region its reputation as New Zealand’s premier fly-fishing destination. The skillful sight fishing and 'match the hatch' techniques required to catch these fish draw much international interest , and many anglers visit in search of the ultimate fly-fishing experience. While many of our rivers do not support the sheer numbers of fish found in many American waters, the opportunity to spot and stalk individual trout more than compensates for quantity. This is akin to hunting; we stalk, locate and cast to trout in their natural environment, where stealth and presentation mean everything. Many of these fish are large – a 6-pound (circa 24-inch) trout will fail to raise the eyebrows of an initiated local – although many would put the average size of the trout that we encounter at around 3 pound (18inches). 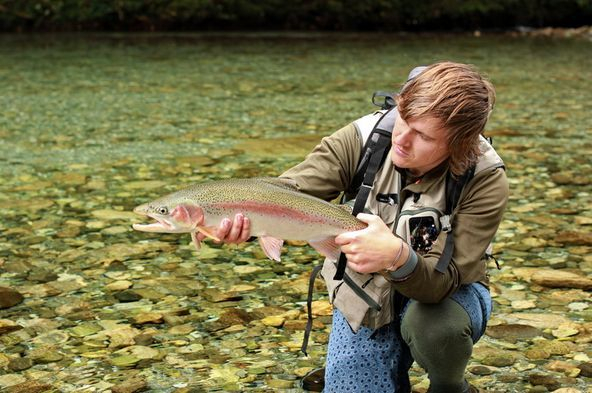 With the wide variety of waters available throughout the wider Queenstown area, both backcountry and local there are more than enough angler days to fish each day of the season without covering the same productive beat twice! Many dozens of rivers and streams are accessible by 4WD as daytrips, half day trips, or included in a multi-day itinerary. No matter what the conditions or the weather, Chris is one of the few who can always find you fishable water, having regularly produced on days where others will often cancel. 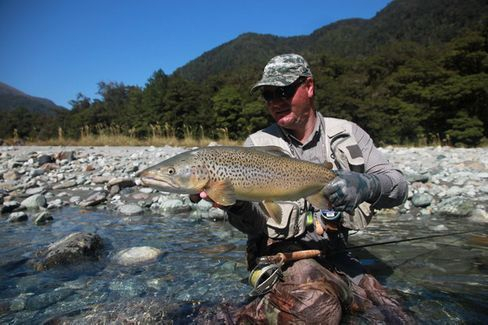 A typical day involves being picked up from your accommodation, or meeting at a prearranged location to maximise fishing opportunities, driving to our destination by air-conditioned 4WD vehicle and sampling some of NZ’s finest small stream fly fishing. The average day allows for around 7 - 8 hours fishing time, although one will never be pulled off the river if Chris thinks an evening hatch is imminent on multi day adventures. Travelling times to our fishing areas vary depending on conditions, though are generally between 30 - 60 minutes drive time each way. Heli-Fishing and backcountry options available. Probably the best way to experience the wide variety of fishing that Southland has on offer, counter the ever changable weather, and to get your eye in is a multi-day trip where you hit the road staying close to the areas being fished at a selection of cabins, farmstays, country hotels, and bed & breakfasts. This reduces travelling time, maximizes the time spent fishing, and provides more flexibility for dealing with adverse weather conditions. Ask Chris about his backcountry campouts and car camping experiences. Email Chris Now for more information, and to get the ball rolling. 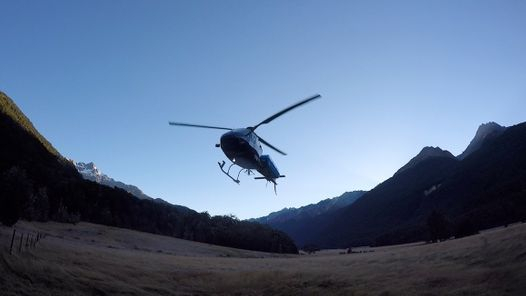 Go remote, into waters rarely fished by the majority of anglers with a Heli Fishing Adventure. Heli fishing isn't necessarily about finding larger trout, or bigger numbers of fish. It is all about getting into truly remote waters and experiencing the challenge of deceiving wild brown and rainbow trout in the breathtaking surrounds of inaccessible mountain valleys and gin clear waters. Available as a day trip, or incorporated into a multi day itinerary with camp out options. Price varies with flight duration and a quote can be arranged on application. Double Handed rods are a great way to get big flies deep, and open up the potential of our larger rivers. Let Chris introduce you to the art of Spey casting on the renowned, big-water rainbow trout fishery of the Upper Clutha and other big water rivers. Using two-handed Switch rods and a range of skagit, scandi, and other specialist heads, Chris will introduce you to the fundamentals of spey casting, and effective techniques to maximize the potential of large water fisheries. We actively promote 100% catch and release. Take nothing but photographs: leave nothing but footprints. - An unbeatable learning experience upon some of the worlds finest trout streams. NZD $950.00 per day. Maximum 2 anglers for safety and logistical reasons. 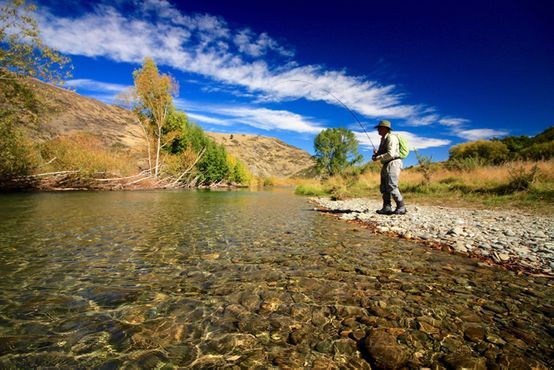 A New Zealand freshwater fishing license can be arranged by your guide, but is not included in the fee. Due to the demand for Chris's services it is advisable to book early, to secure your choice of dates. Bookings are confirmed upon receipt of a 50% non refundable deposit of the total guiding fee. For cancellations within 10 days of the trip date payment is required in full. A number of locals prefer to 'wet wade' here in New Zealand. That is, utilize light, quick dry style trousers and boots / comfy sneakers. 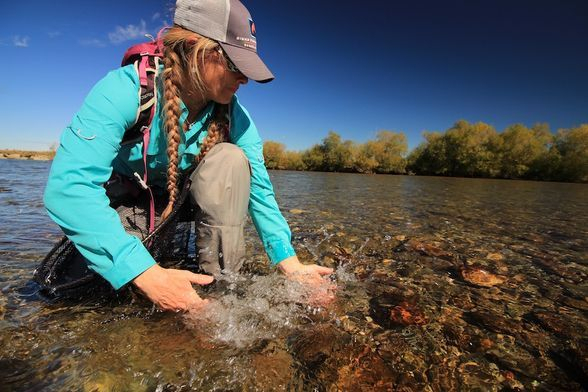 However if you are unfamiliar with colder rivers or inclement weather and do require waders, quality SIMMS waders and boots are available for $50.00 NZD per day, per person. Please let Chris know in advance if these are required. Chris holds Simms Freestone Waders and Boots in the standard sizes from S - XL waders, and size 7 through 14 boots. Chris Dore reserves the right to cut short, cancel or postpone any trip if he considers conditions to be unsafe. Whilst we are guides, we are not gods and thus cannot control the weather. It is very rare for us to cancel a day due to inclement weather, and we pride ourselves on our knowledge of our waters, and a variety of cutting edge techniques to give you the best opportunities on the day. Chris carries a cellular phone, a 406 MHZ Personal Locator Beacon registered with Maritime NZ and a Satellite phone to ensure that if help is required, fast, efficient assistance is close to hand. Chris also operates under a professional Safety and Risk Management plan as documented by the New Zealand Professional Fishing Guides Assn and approved by Occupational Health and Safety NZ (OSH). Combined with Chris' extensive outdoors experience and comprehensive training you can be confident you are in capable hands. Large, wild trout in pristine water are not easy. Their size and age suggests a natural instinct for danger and these fish have been around long enough to know how a fly should behave, and what should, and should not be looming up behind them. Presentation is everything, and the gin clear water ensures that if we can see the trout, the trout can certainly see us. Many come to NZ unprepared for our style of fishing. “This is a whole new ball game” is a common statement amongst visiting anglers. Whilst I can provide top quality fly-casting tuition as an FFF Certified Instructor this works best if the groundwork is already there. Whilst I cater to beginners through to the more advanced angler, practising before the ‘big game’ is always a wise choice. Work on both your overhead and roll casting technique. Efficient fly-casting accuracy at various distances from 20 through to 40’ will help you secure your trophy, and do not forget to practise casting off the opposite shoulder at targets to assist in those often windy conditions. Reduce those false casts – a 50 foot cast requires but a couple at the most, for balance and distance calculations. Its all about being able to place that cast on the dot accurately, time and time again: with all the natural food available the trout wont always take your fly on the first, or even third cast. You can easily improve accuracy by practising on your lawn at home, before jumping on the plane. Do this and you will catch more fish. Simple! Whilst distances exceeding 40’ are not often required it will help to have a longer cast in your repertoire. You will find that 40’ presentation will become a walk in the park if you can confidently throw 60’, and the ability to attain a deeper rod load will assist in windy conditions. If you dont put that fly in front of the trout without alerting him, he will not eat it. The Pro Golfer doesnt head out to the green without first putting in time at the driving range. By practising for 10 - 20 minutes, a few times per week on the lawn at home, you will notice a marked difference in your casting within a few short weeks. Laying the groundwork before you arrive will put you in a better position for success for when you find yourself 30 feet away from a large, free rising New Zealand brown trout. Make those first casts count! Chris Dore. Professional. Friendly. Experienced.